This well-designed remake is worth reviving the classical break-out arcade game. The objective of the game is to complete all levels and get the highest possible score. 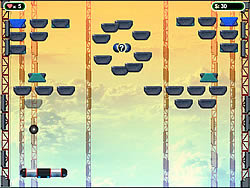 Once you have broken all bricks on the current level you will immediately proceed to the next one. In order to make your task easier, you can pick up various power-ups.